Egypt is a country situated at the northeastern corner of Africa. Egypt is seen worldwide with awe for its beauty and inspiration for its diverse past cultures. The name Egypt in itself hold different meanings. In Ancient times, Egypt was called Kemet meaning “black land” owing the name to its fertile black soil in contrast to the desert land , that is, Deshret meaning ” red land”. 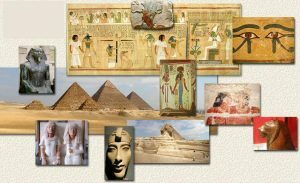 The geography of Egypt has played a significant role in shaping the Ancient Civilization. Egypt is the perfect combination of synchronization of the opposites. This country is adorned by the blue waters of river Nile. The presence of Nile river between the Deserts has not only created the scope for survival for people but also provided fertile soil for rich cultivation. Egypt is home to a wide variety of flora and fauna. The best places to see Egypt’s wildlife are in its oasis, deserts, mountains, coastal areas, river islands, and wetlands. The evidence of animals like gazelles, elephants, cheetahs have been seen in the art of ancient Egyptians. 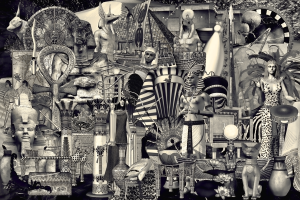 Ancient Egypt is seen as the period when Egypt was ruled by Pharaohs, but what was before Pharaoh. No civilization emerges suddenly, there is always a process that leads to change in culture with time. 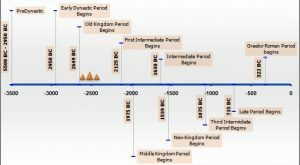 Egypt was ruled by Pharaohs after 3,000 BC but what existed before that? In the Stone age, people lived on the sites fairly high up on the land of the Nile from Delta to Aswan. Early settlers began to grow barley and domesticate cattle. they built villages with small mud huts in the parts of floodplains that seemed safe for habitation. This period has left behind magnificently carved ivories, slate palettes, and fine pots. Elaborate burials with grave goods were also found from this period. 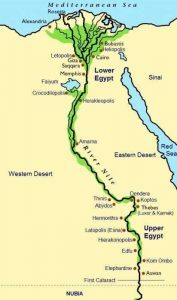 Ancient Egypt was divided into separate kingdoms: the upper Egypt and the lower Egypt. These two areas had different traditions and beliefs. The first evidence of unification of Egypt was through the analysis of the first artifact found of Ancient Egypt, that is, The Narmer Palette. This ceremonial Palette was the first historical document, dated to 3,150 BC and it clearly depicted the divine status of the Pharaoh. During the rule of the Pharaohs, Egypt experienced fascinating changes in politics, economy, society, and religion. These fields are interlinked and therefore illustrated simultaneously. Due to the high agricultural cultivation, Ancient Egypt became an important center for trade and commerce. Many middle eastern cultures blended into this ancient blend of riches. Evidence of these connections has been found from the art of Ancient Egypt.The concept of art and literature were also closely linked. this factor helped in the development of Egyptian writing called Hieroglyphs. The writing , however, changes with the societal status as the carving on the wall of Ancient tombs is different from the day to day script used by commoners. Flax provided linen for clothes for everyone in Ancient Egypt, although, the way of wearing clothes was according to the social status of an individual. The ancient Egyptian religion is yet another fascinating feature of this civilization . there are myths and legends about these Gods and Goddesses in which ancient Egyptians shaped their culture. 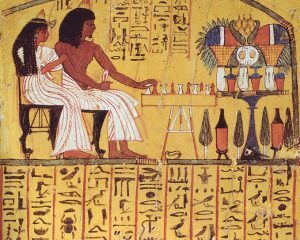 The concept of afterlife that paved the way to “mummification” emerged from these legends.